After what felt like a month long heat wave, there finally was a chill in the air last night. I'm not sure how long this cool down will last (it's supposed to be back in the upper 80s this weekend), so I took full advantage and wore my favorite leather jacket out to a casual dinner with a girlfriend. My lace heels and delicate jewelry were just the accessories I needed to balance out my edgy look. You look radiant, the leather jacket is amazing! I'm freezing here in the Netherlands (50 degrees), because of me we can really swap weather if you prefer it to be cold ;) Enjoy! Wow, I didn´t know that you are pregnant. Congrats!!! I love this look, specially the gorgeous jimmy choos. That leather jacket is amazing! Such a chic look! You find the perfect balance between leather and lace ! wonderful look ! so stunning!!! i love leather and lace together! Those lace heels are so gorgeous! loving your shoes! just fabulous! You look chic - loving the jacket! I was so glad for the cool down! The only bummer is that I've been sick at home so I didn't even get to wear my jackets :( I hope the 80's don't stick around for too long! You look amazing! This is such a great easy but edgy look. You look amazing! So glad the weather has cooled down a bit for you guys in la. I love that jacket. It's the perfect drape collar. Wow, that jacket is gorgeous! It's exactly what I want, but can't seem to find! You look beautiful, I love the Zara clutch too. Love your jacket! You look hot! Holy crap you look gorgeous!!! Love the drapey leather jacket....& the purse is too hard to ignore!!! Dear the bis baby stomach is so beautiful - you and your outfit are as well! 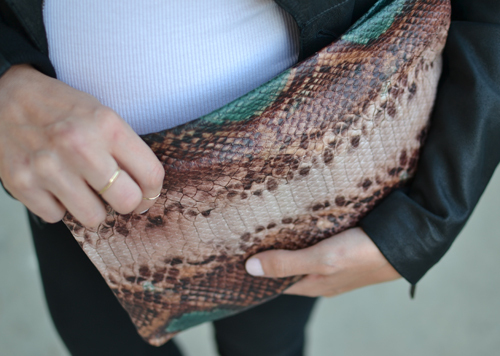 What a loooooovely handbag...it looks so lux...the snakeskin is awesome, esp with that touch of colour! Swing by to enter to win a gorgeous metal collar bib necklace by LAB! This leather jacket is amazing, Audrey! Love the collar -- so chic! That leather jacket is sick! and i can't believe that clutch is zara, they have been killing it lately.